How does it work, and who are these mixing lessons intended to help? These mix lessons are intended to help engineers (and artists who self-produce) create better mixes. Multiple lessons can be booked at once using the booking calendar at the bottom of the page. I’m currently only taking lesson bookings a few times per week as i’m also mixing and recording full time for clients and lesson space is limited. We can then check out the audio or protools session together via Skype screen-share, and then listen and look at the session together. Before the lesson, email me a listen of questions or topics that you are interested in learning about. We can discuss them during the lesson, and I will offer suggestions to help solve your issues. For this type of lesson, if you send me some ideas you are interested in exploring beforehand, or explain problems you are having with recording or mixing then I can prepare ways to help you solve them. I invite you to send me a protools session or set of audio files (WAV or AIFF) for a project you’re working on that you would like help with or have questions about. I will then spend our first lesson checking out you’re mix session or audio files, offering suggestions, and showing you how I would approach different aspects of the mix. To give you the most benefit from this, I will only use plug-ins that we both have in common if possible, and will send you a copy of the session we worked on so you can open it and further analyze what I did. As well, this gives you the opportunity to listen and audition the mix changes I have made in full quality. 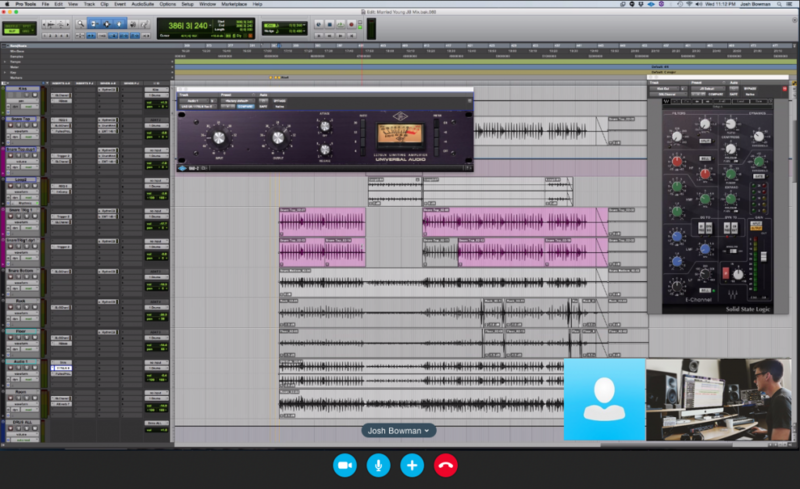 I’ve found the most effective method for this real-time Skype lesson is to stream the mix audio via skype itself. This doesn’t offer a high fidelity listening experience as far as music quality, but it allows me to stream you my computer screen AND the audio in real-time, so I can explain workflow and mixing techniques in real time and we can chat about any issues you are having with your mixes. The important part is my explanation of workflows, techniques, and methods. I will transfer you the session file from our mix lesson as well as any new audio I have created. You can listen in your studio and check out what I did and analyze my suggestions in full quality. Payment is made via PayPal using the booking calendar found at the bottom of this page. You can pay via credit card without a paypal account if you do not have one. File transfer is done via the service of your choice. I generally use dropbox or google drive, but many people prefer wetransfer.com or similar services.